L_MO This stuff is awesome. Followed the instructions & it blended in perfectly!! I honestly have no idea how anybody could screw this up! Jim I needed to repair a relatively small area in a very visible wall. By following all the instructions and testing various spatters until I found just the right one, the product worked perfectly. I was able to match the existing orange peel spatter and paint the repaired area within an hour. This product was exactly what I needed. don714 I bought this product 18 months ago to use on one small area. It worked better than expected and the best part is that since then I have used it 2 other times. The last just today and it still works just as good as the first time I used it. Great product. 1955Stude We're remodeling the guest bath in our house. All the walls were fresh drywall. First off if you're having to texture anything bigger than a patch or small wall, I would recommend a professional set up and not aerosol cans. The cans don't cover as much as the manufacturer claims and the performance between cans is inconsistent. Each can is a new learning curve with the adjustments and all. The nozzle assemblies seem flimsy and cheaply made. One nozzle came apart as I adjusted it. allioopp So far I am not super impressed with this product. We have had one can that stopped spraying halfway though the can and now just spurts out and runs down the side of the can. We used the professional can in a closet and noticed "pocks" in some of the texture, but went on because it was a closet and no one would really notice. Now we have used it on a longer run of a bedroom wall. Trying to match the existing texture is hard enough, but what is more disappointing is how airy the texture is. When we used the heavy orange peal, most of the texture has popped bubbles in the texture. Even after painting it still looks "pocky." We shook the can for the minute as instructed in the right temperature. Starting to regret the $65 we spent on 3 cans. Thinking buying a hopper and mixed the powder would have given us a better result for less money. Somber I'm very disappointed in this product. I had no problem dispensing it but after painting over it I can still see the spots that were textured. I followed the directions by priming the textured area sprayed before painting. When you look at the wall from the right angle I can see a duller-colored spot. I emailed Homax about this issue and she verified that I did it right. I used water based spray and water based paint. I just don't know what went wrong. RyszardZ Had 2 issues with the product. (1) After using on about 10 small, 4-inch diameter, areas with light texture the product would not spray any more. Cleared the tip, turned up the pressure and switched to large texture and still nothing would come out. The can was still 90%+ full. (2) The small light texture areas that I did get to apply swelled up and looked like splattered foam after applying the primer coating. I had to scrape off the texture because it looked so bad. On the positive side, the pressure and spray controls were very useful. Don't know why the Pro version of the same 20oz product is so much bigger? Must be the spray control parts are bigger. What's with the air bubbles? Matt1970 Like another reviewer here, I got texture with air bubbles that dried to a pocked result. Fortunately, I never went past the test patch on cardboard. My can is a little old, but never before used. Furthermore, when I dialed the texture adjustment to coarse, the mechanism fell apart. 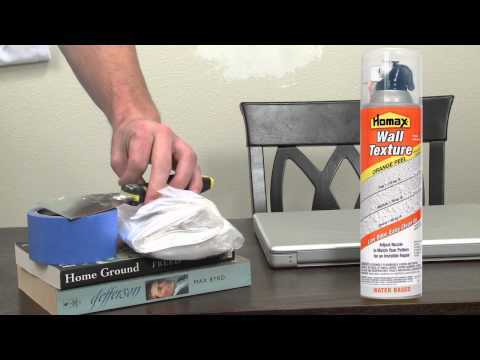 Homax Orange Peel Water-Based Aerosol Wall Texture is a low-odor, water-based formulation of our most popular “orange peel” and splatter texture for textured drywall repair. Variations in orange peel texture (also called splatter or eggshell) help hide surface imperfections, while reflecting light and adding interest to a room. Our water-based formula excels at replicating orange peel texture patterns so you can get professional results fast. Great for patching and texturing small rooms and accent walls. Low-odor water-based formulation of our most popular “orange peel” and splatter texture. Match a wide range of texture patterns with the advantage of water cleanup. This fast-drying spray texture is a great choice for patching in occupied spaces like offices, schools and hospitals. Can also be used for texturing small rooms and accent walls. • Covers up to 110 sq. ft.